It was a classic "miner meets Agent" tale. Joksz Hakaari met Agent Minx Mattel. Our Agent didn't approve of what Joksz was doing--in Halaima, of all places--so naturally Minx killed her. 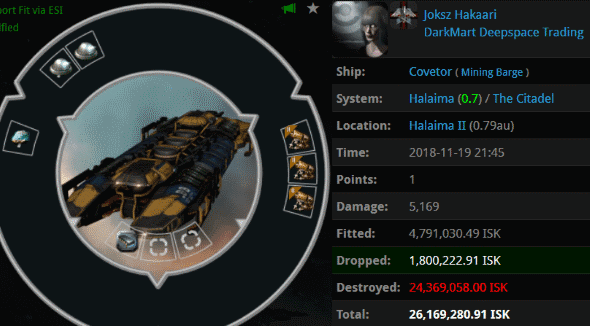 Joksz didn't want to be ganked again, so she bought a mining permit for 10 million isk. ...But she didn't mean it. A bot-aspirant with a permit is still a bot-aspirant, so it was inevitable that Joksz would get her permit revoked. It didn't take long. Joksz couldn't bring herself to wear her permit proudly. She had some weird need to keep her bio exactly the way she wanted it, without regard for anyone else. Without regard for civilization. Civilization has a way of making itself felt, though. 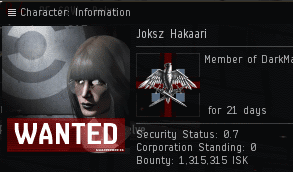 Joksz was surprised to find that her character profile had been altered, in a way, without her permission: There was a bounty on her for 1,315,315 isk. Ah, the mark of 315. Our Agents have been using it for years. The passage of time hasn't diminished its potency, either. The minimum bounty that you can place on a character is 100,000 isk. This has made 315,315 isk bounties extremely popular--and affordable. If a character already has a bounty, an additional amount can be placed so that the bounty's new total ends with 315. Anyone can place a bounty on anyone. 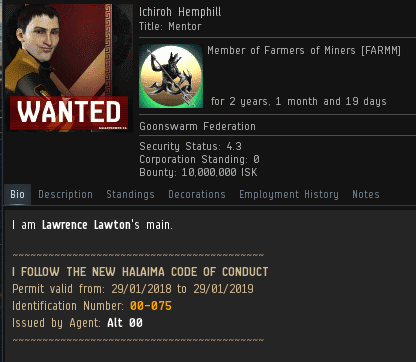 Though not the ganker himself, Agent Ichiroh Hemphill saw fit to bestow the mark of 315 upon Joksz. Look at Ichiroh's smile. It speaks to the satisfaction he gets from helping a lot of people. Joksz whined. It's as if she thought she could manipulate the system by working around the rules. Sorry, miners, you're not that clever. There is no workaround for the Code. There is only total, absolute, unwavering compliance. When given a bounty, the miner usually can't get rid of it; that would require seeking out PvP. The only answer to that nagging "315" is to spend money on an even larger bounty. Joksz chose to even out her bounty. Perhaps doing so had a calming effect on her. Nevertheless, another mark of 315 is just 100,315 isk away. And anyone could put it there. Why yes, dear reader, precisely like that!